A century ago, on April 29, 2016, the Irish Republic ended its brief existence with an unconditional surrender. Though successfully thwarted, it set off a series of events that led to the outbreak of an Irish war of independence between 1919 and 1921. World War I presented an unparalleled opportunity for these revolutionaries. By October 1914, lead plotters Tom Clarke and Sean MacDermott had asked a team to look into the prospects of holding a successful rebellion in wartime. The group convened to conduct this investigation were Patrick Pearse, Joseph Plunkett, and Éamonn Ceannt. In plotting, they succeeded where no previous Irish rebellion had before, most notably by successfully shutting out spies and informers. Only in the weeks immediately prior to the Rising did the police manage to secure two human intelligence sources – and even these were relatively low level. Codenamed Granite and Chalk, these two informers monitored the location of arms dumps while plain clothes detectives tracked movements in and out of locations including Clarke’s shop. Despite gathering evidence that would prove useful at post-insurrectionary trials, Granite and Chalk failed to penetrate the inner circles of the conspiracy and plotting continued. Secret wires and messengers travelled both to the US and Germany to progress different strands of ambitious plans for a nationwide rebellion. Meanwhile, across Ireland, the open military organisations of the rebellion – the Irish Volunteers and the Irish Citizen Army – drilled and paraded with weapons in broad daylight. The officials at the Irish Office were reluctant to suppress these organisations. Even when they began to conduct mock attacks on buildings around Dublin, the decision was made to let them be. The view from Dublin Castle, working on the advice of senior Irish home rule MPs, was that suppression might be counterproductive. It’s clear that the people behind the rebellion benefited as the continental war worsened. Irish support for the war effort had begun to diminish from the spring of 1915 onwards. The disastrous Gallipoli landings, first in April and again in August 1915, witnessed the decimation of Irish units in the British army, including the Dublin and Muster Fusiliers and the 10th (Irish) Division. There are several reasons why Irish nationalists were justified in believing that the social contract had been broken by 1916. For one thing, the mandate of the British parliament had run out by December 1915. By consensus of parliament, a coalition government had been formed in May to avoid going to the polls in wartime. What’s more, Ireland had been granted Home Rule in 1914 but this had been put on ice by the war. By 1916, many questioned when Home Rule would be granted given the unexpected longevity of the war and the influx of anti-Home Rule unionists to Cabinet in May 1915. There were also deep concerns that mandatory conscription to fight in the war would be extended to include Irish men. The late and greatly talented Keith Jeffery wrote of how the threat of conscription stimulated resistance in places as varied as Belgium, Vietnam, Nyasaland (Malawi), Syria, and Senegal. There is some evidence to add Ireland to this list. The fear of compulsory service in what had become a continental slaughter was both real and immediate. Aversion towards service in the British crown forces had been a pillar of republican and separatist activity at least since the second Boer war of 1899-1902. The decision to resist conscription in 1916 should be seen as a continuum of this. When the rising broke out on Easter Monday 1916, it was destined to be a much smaller affair than what had originally been planned. The original idea was to have a national uprising (with German aid) on Easter Sunday. But that had to be abandoned when the Irish Volunteers cancelled the manoeuvres that were to be a cover for the uprising. A contingency operation was then hastily implemented. 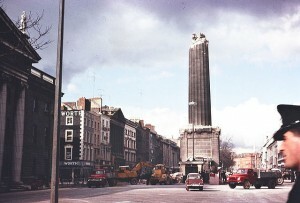 In Dublin city centre, six garrisons were occupied by approximately 1,500 insurgents. The rebels headquartered themselves at the General Post Office. It was from here that they declared an Irish republic proclaimed. Battalions of the Irish Volunteers occupied the Four Courts, Jacobs Biscuit Factory, Boland’s Mills, and the South Dublin Union. A sixth garrison consisting of troops of the Irish Citizen Army dug in at St Stephen’s Green, covering the southern approaches to the city before being dislodged by machine gun fire. They retreated to the safety of the Royal College of Surgeons, where they remained, well defended for the rest of the week. The rebels barricaded the streets and awaited the advance of infantry and cavalry. Where this did occur – at Mount Street, at the Four Courts, and in early engagements at the GPO – the rebels were overwhelmingly successful. However, by Wednesday, the authorities were deploying artillery – something that had not been planned for by the insurgents. Zoning in on the headquarters at the post office, the artillery dislodged the rebels by Friday night. On Saturday April 29, the six-day republic ended with an unconditional surrender. More than 450 people died in the events. 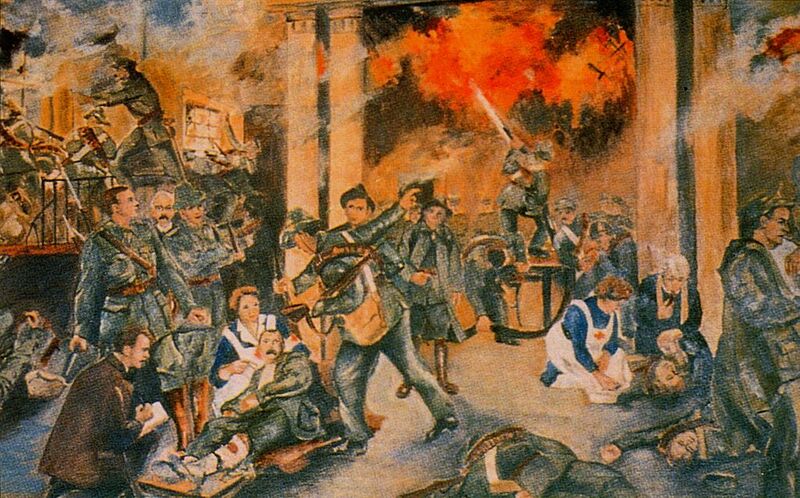 Although the rising was largely confined to Dublin and was successfully thwarted, it set in train a series of events that led to the outbreak of a war of independence between 1919 and 1921. An Irish Free State was established in 1922. Civil war quickly followed and did not end until May 1923. So from the outbreak of the First World War in 1914, Ireland was not at peace for a full decade. The persistence of political violence after the armistice of 1918 is atypical in a western European context but entirely fitting with the shared experiences of Europe’s Balkan, Baltic, and Eastern peripheries. Conor Mulvagh is a Lecturer in Irish History, University College Dublin. This article was originally published on The Conversation. Read the original article.